Economics is a social science that analyses the production, distribution and consumption of resources. Students learn about microeconomics: supply and demand, trade and comparative advantage, modes of competition, and macroeconomics: the role of central banks, monetary and fiscal policy. 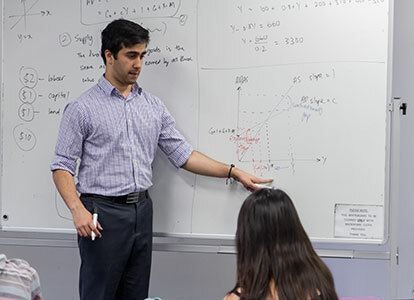 Our approach to economics is similar to our approach to science and maths – we facilitate a student’s understanding of the underlying concepts, rather than rote learning / memorisation. Our tutors will teach according to the syllabus, covering each dot-point and satisfying all outcomes, or if students prefer help on a specific section of the course, we can also tailor a program to suit those needs as well. A key challenge to this course is the requirement of incorporating contemporary economic events into exam responses in order to secure the highest marks / ranks. Our tutors can certainly help by providing students with timely and relevant supplementary materials for them to use in their assessment tasks and exam responses.